Successful Outsourcing – Why, How, Who? Most, if not all readers of this article will have been born in the 20th century. It was a period of unprecedented change, flowing from the industrial revolution and two world wars. Together with incredible technological innovation, the post war years yielded a mountain of demand for products. This led to increased levels of trade to distant locations, which were facilitated by more efficient and cost effective use of commercial air, sea, road and rail assets. Consequently, logistics management became a prominent business practice, with organizations privately investing in their own transport fleets and warehouse assets and employing staff to run them. Driven by stable demand, it was not uncommon for dedicated logistics staff to stay with companies for 30-40 years. However, during the 70s and 80s, when post war demand for goods and services became volatile, profits thinned and long term employment gave way to a new era of demand variation. Employee redundancy became common place as companies found they could not sustain their burgeoning cost base against fluctuating revenues. So the concept of life time employment with a single company largely disappeared. In the meantime companies still had to deliver goods to their customers despite variations in demand and labour supply. How have the coped? Outsourcing! The new supply chain remedy born during the 1970s and 80s and refined over the years as globalization has materialized. Outsourcing is defined as the contracting out of services. In this chapter, outsourcing will refer specifically to transport and warehousing functions. Its content includes reasons why companies outsource, how to choose a third party logistics organization (3PLO), who the main players are, and how to be successful in working with a 3PLO. Why Do Organizations Outsource Logistics Operations? Peters and Waterman in their best seller ‘In Search for Excellence’ identify one of the eight factors of organizational success as “sticking to the knitting”. They warned that companies which stray from their core business, risk distraction from of their employees’ attention. This loss of focus can result in under performance and revenue reduction. Many enterprises have taken heed, and determined that inbound and outbound transport and warehousing are consequential processes of their business rather than fundamental or core processes. This has fuelled growth of the third party logistics industry and expansion of thousands of 3PLOs. 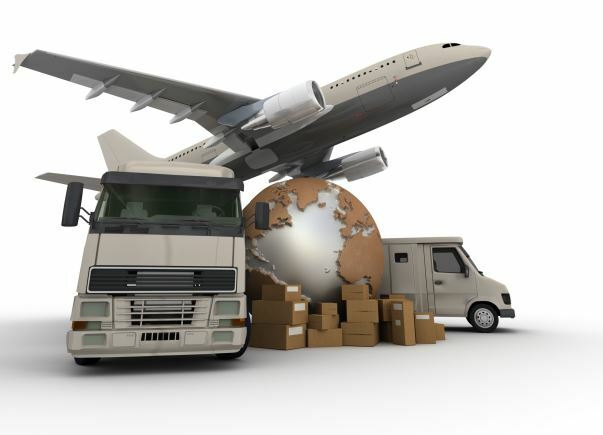 While many logistics service providers commenced as domestic carriers or international freight forwarders they have diversified over the last 30 years. They now engage, in contract warehousing logistics, plus many other value adding services. In effect, the expanding new breed of 3PLOs have plied their trade, honed and grown their skills so that there are now oodles of experienced providers to choose from. Related to the core skill issue, often organizations which have a strategic focus, other than in transport or warehousing, cannot attain the desired performance levels and Key Performance Indicators (KPIs) required by their customers. For example, companies who have their own in house vehicle fleets often struggle to deliver products on time. In competitive terms, a service ratio of less than 98% of deliveries delivered on time is a major issue for modern consumers who are fickle enough to change supplier if this ratio is unmet. For enterprises that run their own fleets, merely dealing with the complexity of transport networks, contractors, inventories, industrial unions and cost control is tough enough, so achieving 98% on time performance is for many, just a dream. On the warehousing front, checking performance against just a few industry KPIs can quickly help managers determine how effective their operations are. Telling signs are low levels of inventory accuracy, low stock turns, and low order output ratios per labour hour, high levels of unexplainable losses or damage to goods, high operating costs, high customer performance complaints and high employee turnover. When these signs are evident firms often choose to outsource rather than waste time developing their own solutions. Warehouses and vehicles are expensive to purchase or lease and can tie up millions of dollars that could otherwise be invested in the core business of the firm. Consequently there is a trend for firms to remove warehouse assets from the balance sheet, and re-direct capital gained from sale of assets to working capital and / core asset investments. In choosing to outsource, firms can therefore transfer all of the costs of distribution to their profit and loss account. Such divestment strategies by manufacturers have become a blessing for third party logistics providers who have won large amounts of new business for this reason alone. With the advent of the internet, E-commerce, increasing globalization and rationalization of industries, today’s market place demands fast, flexible and efficient supply chains. Coupled with shorter strategic planning horizons, use of 3PLOs gives organizations flexibility to expand or change their method to market and volumes handled with almost immediate effect. So the long term 3PLO agreements have succumbed to the trend for shorter terms of one to five years. There are exceptions of course, but they tend to be very large scale manufacturers where the investment horizon is from 5 to 15 years. The point remains, that it is simply not possible to respond quickly to market changes if there is a fully owned or leased network of warehouse and transportation assets in place. So for many enterprises, flexibility and scalability are sacrosanct. 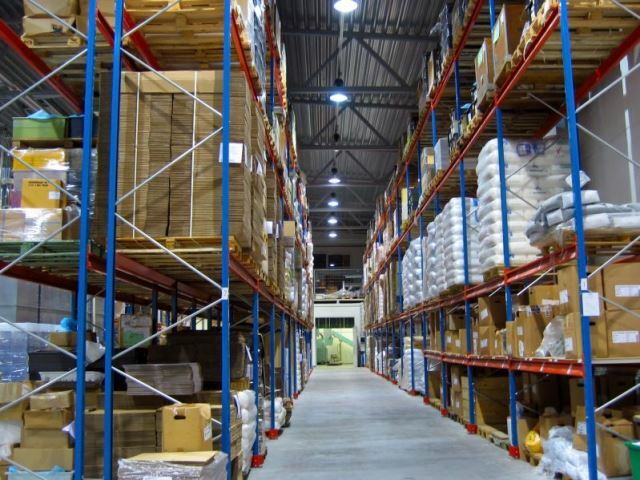 Is Outsourcing Warehousing Right for Your Company? Many companies struggle with the vexing question; is outsourcing warehousing the right strategy for me? To answer it effectively will take more than the pages in this chapter. However, to assist, you may like to perform a quick self assessment. Now if you plot your answers on the matrix below you can quickly assess if using a 3PLO is right for you. Note that the assessment deals with risk. Think of risk in terms of quality of service, damage to goods, inventory control and losses, materials handling capability, cost containment and variation in supply volumes. If the products are uniform, and the process is simple, outsourcing warehousing is straight forward and low risk. This is exemplified by the large number of 3PLO contracts servicing the fast moving consumer goods industries. However, where products have special attributes, low uniformity, and require complex processes to manage, the risk increases. Examples include special build products such as plant and equipment, chemicals, large scale equipment, unusual hardware and spare parts. 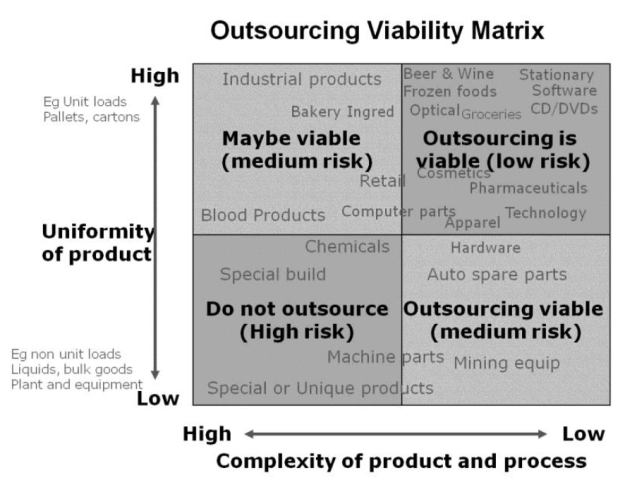 To assist your analysis, examples of industries are plotted on the matrix. 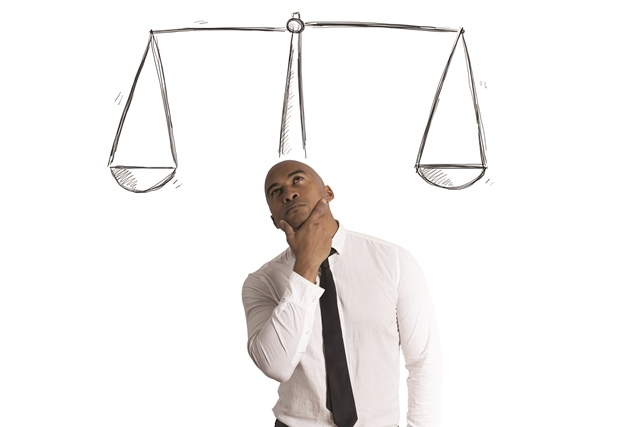 These may help you to compare and decide if your company will benefit from outsourcing. How to Select a 3PLO? freight forwarding (import and export) etc. Others provide many or all of these services in an integrated package for their customers, supported by advanced IT systems. Larger 3PLOs are typically spread across multiple locations nationally or internationally, whereas smaller 3PLOs tend to service local, state or national domains. To understand how these factors interplay, consider the following model. There are four basic types of3PLO. National Specialist: 3PLOs that offer single or limited services to customers within or near their locus of operations. The geographical location tends to be in the same city, state or within a country. Customers that use the National Specialist will substantially operate in their home city, state or country. National Integrator: 3PLOs that offer multiple services to customers within or near their locus of operations. The location may be in the same city, state or within a country. Customers using the National Integrator generally seek a wider range of services aimed at national distribution and some export. International Specialist: 3PLOs that offer single or limited services and conduct intercontinental operations to nearby or distant regions or countries, and/or across the world. 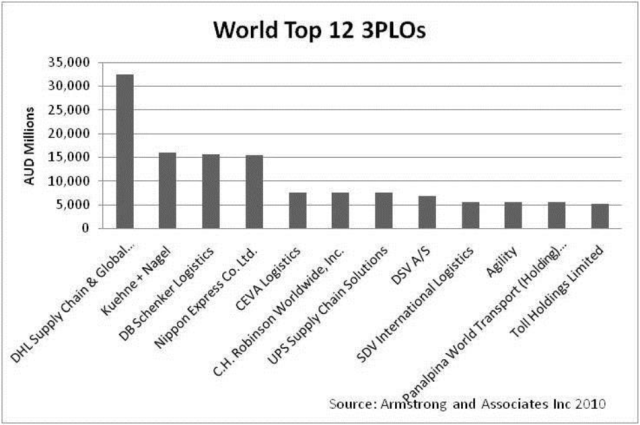 Customers with international operations across the globe, often seek international 3PLOs with similar coverage to handle their logistics. Specialist activities typically include freight forwarding and transport but may also extend to warehousing. International Integrator: 3PLOs that offer multiple services and conduct intercontinental operations, to nearby or distant regions or countries, and/or across the world. 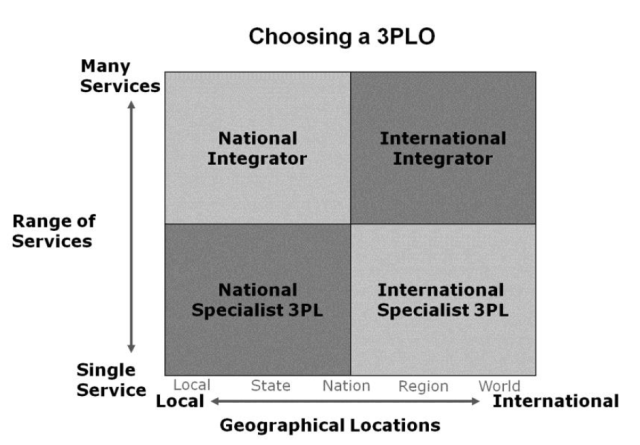 International companies with global warehouse and distribution networks tend to choose International Integrators as their preferred 3PLO. The reasons are that often multiple services are needed for global networks, along with systems to support them. The International Integrator typically has the global management capability, scale, flexibility and financial stability to support truly international customers. Who are the Key 3PLOs? Now that you know what type of 3PLO to choose, who are the major contenders? On a world scale there are thousands of providers offering third party services. However, there are only a handful of very large ones with the ability, network, systems and infrastructure needed for multinational and multi modal customers. 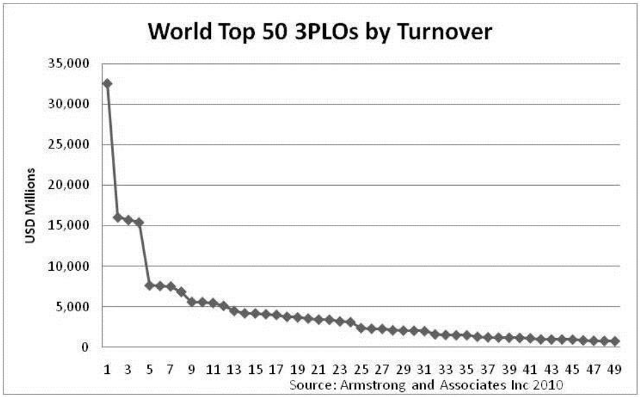 The World top 50 3PLOs in terms of Gross Turnover appear below. Interestingly, there are only twelve with revenues over USD5 billion. They are, in descending order: DHL Supply Chain and Global Forwarding, Kuehne and Nagel, DB Schenker, Nippon Express, Ceva Logistics, CH Robinson, UPS, DSV, Sdv and Agility Panalpina and Toll. (Source: Armstrong and Associates Inc 2010). With the companies lower than USD5billion, there are a huge number of small specialist players, with revenues well below the USD0.5 billion mark. For the top 50 larger 3PLOs, increased globalization has triggered many recent rationalizations, mergers and acquisitions. The continuing rationalisaton of the industry will see fewer large conglomerates competing for purchasing power over air, road, rail and sea shipping corridors. Why? In the past companies could pull adequate margins off freight handling alone. Now, with smaller margins, volatile fuel pricing and exchange rates, major 3PLOs have been pressured to vertically integrate and build networks of contract warehousing facilities to supplement their revenues. What are the Key Drivers for Success in Establishing a Good Customer and 3PLO relationship? The outsourcing decision must align with the company’s strategic direction. This is a common sense proposition, but unfortunately not well practiced. Amazingly, many companies have suffered after outsourcing decisions were made at an operational level, without due regard to the board’s supply chain strategy. Alas, in some cases, there is no supply chain strategy to speak of. This can cause organizational stress and is a nightmare to remedy after contracts are established. These days, third party providers are aware that their clients may be deficient in strategy formulation, so they include clauses in contracts which enable them to change pricing and performance mechanisms if a change in company strategy or method to market occurs. When seeking third party quotations and contracts, there is no room for intuition, or best guesses on order velocities, volumes, processes and service requirements. Very detailed specifications must be prepared by enterprises with full disclosure of all available data before a quotation from service providers is attained. There is rarely too much information that can be gathered. But where there is an absence of sensible interpretation of data, this can cause major issues in the outsourcing relationship. For instance, beware of basic pricing mechanisms such as Customer Cost of Goods Sold, Volume Sold or Percent of Revenue. On the surface these appear to be simple pricing gauges, but often they force one party, either the customer or logistics service provider, to prosper or lose unfairly. The supply chain interactions of physical movement and electronic information is complex and overly simple charging mechanisms deserve close scrutiny as they can lead to disputes if one or the other party decides that they are being ripped off. Both during implementation and the ongoing partnership, a competent team is essential. Both the customer and the third party logistics company must create an open and trusting working relationship. Each company’s team should include senior relationship managers from across the organizations who meet regularly to discuss and monitor progress and performance. Too often, once an agreement is signed, implementation is left to the stewardship of the logistics service provider. This is a mistake. It must be a joint exercise. The best implementations are those that have a key member of the customer on the team to lead, organize and develop the solution to full implementation with the provider. Such implementations are usually augmented by robust project management methods to ensure that all milestones are achieved. Relationship or operational issues that are not dealt with proactively and in good time can fester into relationship breakers and end in disaster. So, both parties should take a long term perspective and be mature in their outlook and approach, always avoiding disrespectful behavior to the other party. It never helps if one party is kicking the other. During implementation planning phases, representatives from each company should meet weekly to discuss implementation tasks. Some may argue that this is too often, but the regularity maintains momentum and full attention to successful outcomes. A common theme with aircraft accidents is that there is not usually a single cause that brings a plane down. It is normally a series of related and unrelated events that culminate in catastrophe. This is the same for outsourcing contracts. Dealing with issues as they arise helps prevent and obviate relationship and performance disasters. The contract and agreement should be subject to regular reviews of KPIs. Data speaks volumes in terms of performance. For both warehousing and transport, KPIs should be agreed at the outset. Typical measures include delivery in full on time, goods lost in transit, stock damage, ullage (unexplained loss or damage), inventory accuracy, time to receive goods, and time to dispatch goods. As a rule of thumb, no more than six KPIs should be used. But make sure you choose the ones that are most meaningful to your business. In this way a focus on the facts can help remove emotionally charged opinions or feelings by either party. This chapter has concentrated on the salient aspects of outsourcing logistics, commencing with a short history of how outsourcing developed in the late 20th century to become a modern and prominent 21st century industry. Then the most common reasons for outsourcing were described as: distribution is not a core skill, sub optimal performance, reduction in asset capital, flexibility and scalability. The question of whether outsourcing is the right strategy for your company was tested with a strategic model to help you decide. Some tips were then proposed to help you select a 3PLO, including the two most important attributes for selection: geographical coverage and scope of services. A short introduction to the 3PLO industry revealed thousands of providers with only a dozen large players at the top end. Finally, to assist your consideration of outsourcing, the key drivers for relationship success were outlined as: strategic alignment, attention to detail, resource wisely, raise potential issues early, and use KPIs to manage. By reading this chapter, you will have gained a general understanding of outsourcing and are now in a better position, to think more seriously about your existing or future outsourcing potential and the vital drivers for success. Mal is Manager Consulting with Logistics Bureau where he leads the Warehousing and Distribution Centre Design Practice. He works with local and international organizations and has over 30 years’ experience in warehouse design and performance. 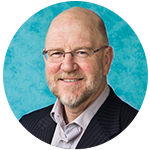 He is a Life member of the Logistics Association of Australia, Member of the Council of Supply Chain Management Professionals, and holds qualifications in Engineering, Logistics and Business Administration.